In this Soulbus-e-Coach Programme, cultural awareness is used as a “conditional aspect” to become multicultural competent. Cultural awareness is a kind of blanket, covering the whole model. One of the most important elements in this Soulbus-e-Coach is to be aware of yourself. Do you know who you are and through which glasses you look to other people? Which norms, values and beliefs do you have? In interaction and communication with other people, especially those with a different cultural background, you have to be aware of their norms, values and beliefs and you are flirting with danger if you simply start to accept our own values and beliefs as right and correct. You must recognise that students and trainees hold a set of values and beliefs, like you also do. We all are engaged in an equal partnership of negotiation when teaching or mentoring. It is called (inter-) cultural sensitive practice: with empathy, trust, respect, etc. During the Programme we want you to be aware of how your own cultural background, experiences, attitudes and values and biases influence interaction with others. The main question to be answered: who am I? First, you have to get acquainted with the concept of cultural awareness. Secondly, you will find out about your cultural self-awareness. What is your cultural background and how does it influence you? This question will also be linked to your workfield. To reach these goals, you read theories, view videos, make assignments and discuss cases with your peers. The order of this chapter: 1. Indicator chart, 2. Cultural awareness, the concept, 3. Self-test, and 4. Reflection. 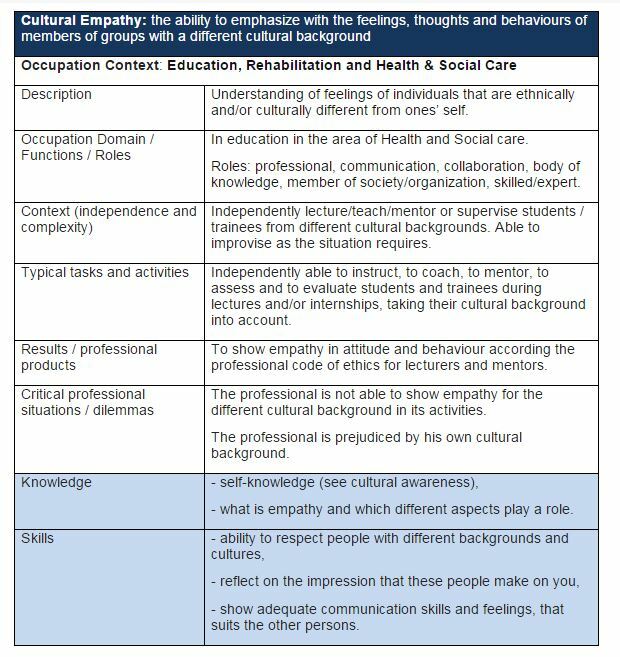 An essential skill in the provision of culturally appropriate services, cultural awareness entails an understanding of how a person’s culture may inform their values, behaviour, beliefs and basic assumptions. Cultural awareness recognises that we are all shaped by our cultural background, which influences how we interpret the world around us, perceive ourselves and relate to other people. You don’t need to be an expert in every culture or have all the answers to be culturally aware; rather, cultural awareness helps you to explore cultural issues with your care recipients more sensitively. Information about specific cultural practices will help to increase your cultural knowledge by providing an overview of cultural characteristics and issues. However, it is always important to identify individual needs and preferences and remember that no individual can be reduced to a set of cultural norms. Understand that the behaviour and beliefs of people within each culture can vary -considerably. Following video shows a part of the River Dance show. Please watch this video. Actually, in this chapter you were constantly reflecting on yourself about your cultural position. This time, your reflection will be based mostly on scientific articles and discussion with your peer group. What’s the moral of the story that the dancers tell in the video “Riverdance”, according to you? And what is the connection with cultural awareness? This question is only possible when you have access to scientific articles. Read following articles and pay attention to the divisions and statements the authors make about self-awareness. How is your position, do you agree with the given theories, or not, and why? 1) Who Is the “Self” in Self‐Aware: Professional Self‐Awareness from a Critical Theory. Perspective by M.E Kondrat (1999)1 . The subject of this article is the different kinds of self-awareness: simple conscious awareness, reflective awareness and reflexive awareness. Focus in reading only on these 3 kinds of self-awareness. 2) Cross-Cultural Differences in the Self by D. Hollan (1992)2. This article is about the too sharp contrasts that are often drawn between Western and non-Western people. Answer the following 16 questions, used by Culture Advantage3. Think of yourself as a cultural being whose life has been influenced by various historical, social, political, economic, and geographical circumstances. This exercise will help you become aware of your historical, ethnic and cultural background. Where did your parents grow up? Where did your grandparents grow up? Where did your great grandparents grow up? What is your earliest memory as a family? What is your earliest school memory? As a family, what events did you celebrate? Have you traveled or moved as a child? Have you traveled or moved as an adult? Recall on international event that happened before you turned 18. Try to answer the following: Who was involved, what was the event, where did it happen, how did it happen, and why did it happen? Recall an event that happened in the country where you were born, before you turned 18. Try to answer the following: Who was involved, what was the event, where did it happen, how did it happen, and why did it happen? What is your earliest recollection as a member of a group? As an adult, what events or holidays do you currently celebrate? What is your background? You may refer to your culture, ethnicity, race, or multiracial/multiethnic background. Even broader, what is your primary reference group that is salient to who you are and what you stand for? What meaning does your reference group have for you? What are your feelings about belonging to your reference group? What do you like and dislike about your reference group identity? What are your personal differences from your cultural or primary reference group? What are your traits, behaviours, preferences and achievements that make you an individual? How does your family see itself as similar or different from a cultural group? What are the values of the cultural group that have influenced you the most? What was your first experience with feeling different from others around you? What are your earliest images of a minority person, for instance, an African American, an LBG person, a transgendered person, an elderly person, a disabled person, or a Muslim? What information were you given as a child about how to deal with minority people? What are your feelings about being a White or a person of colour? To Whites: how do you think of people of colour feel about their colour identity? To people of colour: how do you think that Whites feel about their colour identity? When you’re with someone different from you, how do you find common ground to prevent cultural conflict? Read the article by Murray and Bollinger (2001)5. It’s about how students can raise their cultural awareness in practice through experience of others. Several ways are mentioned. Think of a way in which you would like to learn about cultural awareness in practice and write it down in approximately 250 words. You can use examples given in the article and/or add more options. If you want to read more literature about the importance of cultural awareness in a classroom, see the links down below or explore the literature lists of the given articles for more inspiration6.